Plenty of people didn’t want this show to happen. 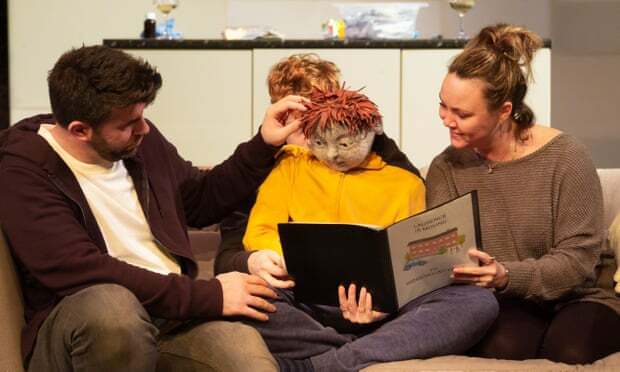 Protesters gathered outside the theatre on opening night and more than 12,000 people with autism have signed a petition, arguing that it is dehumanising to use a puppet to depict an autistic child. What a shame. 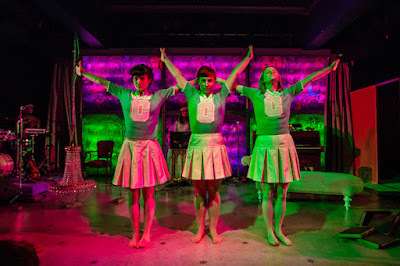 I, for one, am grateful that playwright Alex Oates and the creative team had the guts and integrity to see this one through. Oates has worked with autistic children and adults for more than 10 years. This isn’t a lazily conceived production. It’s the product of extensive experience: a lively, compassionate and darkly humorous show with the unmistakable ring of truth. 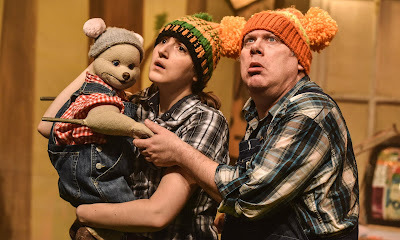 The play unfolds on a pivotal night for husband and wife Martin and Tamora, and their 11-year-old son, a severely disabled and non-verbal autistic child. Someone has called social services and Laurence is heading to residential school. Just who made that call and was it in Laurence’s best interests? There has been so much fuss about the puppet but – as with all good puppetry – it soon begins to feel human. Richly so. Designer Siân Kidd’s model is attached to puppeteer Hugh Purves’s waist, so while Laurence’s face is greyish with a neutral expression, his body is mobile. He fills the stage (lined with geometric patterns by designer PJ McEvoy) with his hums, moans, tics and chuckles. We watch him lose himself in Finding Nemo (again), carefully line up his cakes (again), hug and stroke his parents (again) and just occasionally lash out. At one point, Laurence’s mother emerges with a darkly bruised cheek. It’s a sign of the subtle depths of Dominic Shaw’s production that this biting scene brims with love. Simon Lipkin bristles with a brooding comic energy as dad Martin, manically grappling for his punchlines. Charlie Brooks’s mother is a mesmerising bundle of moving contradictions: powerful, resourceful, loving and broken. As the two struggle to let their son go, Martin reassures his wife: “It’s OK to love somebody, and wonder what it would be like if they were someone else.” Martin has said what his wife needs to hear. She loves and hates him for it.